Excellent soup as is. I chose to add about a 1/4 cup of diced red onion and 2 garlic cloves in step 2. I also added about 2 T of low fat blue cheese dressing after step 4. Seasoned with fresh cracked pepper and Himalayan salt. I wish you would refurbish this recipe for the Instant Pot! Delicious!! 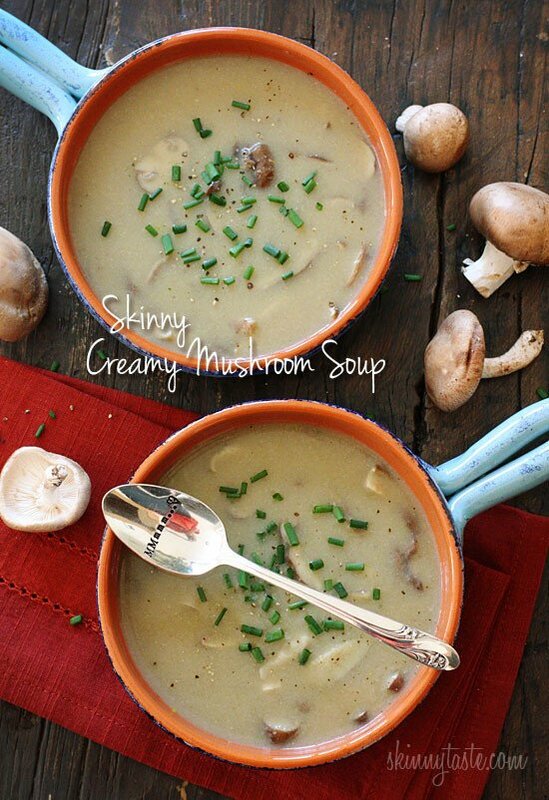 looking for a low-fat, low-salt mushroom soup recipe and came across this one…haven’t tried it yet but have a ‘dumb’ question about the ‘celery stalk’…finely chopped? wasn’t clear… thanks! Leave whole or cut into 2 pieces so it’s easier to blend at the end. Would baby Bella mushrooms work in this recipe? I have a carton of those I need to use quickly. I thought this was incredible. Subbed a carton of vegetarian broth for the bouillon, used 1/2 T regular butter (I don’t use light butter enough to buy for the recipe) and pureed it all (instead of a portion) in my blender. Tasted just like a full fat creamy mushroom soup I’d get at a restaurant. Thanks so much for all the delicious healthy recipes. I just made this soup exactly as the recipe states. I am amazed at the flavor. Thank you, Gina. I always know I can count on your recipes. Do you think this would work in the instant pot? I doubled the celery and chopped up 1/2 lb. of baby potatoes into the pot. I added another cup of water. Splash of milk. Dash of thyme and a sprinkle of parsley. Used 1.5 Tbsp of Butter instead of what’s called for and it came out yummy. Will make again. i had forgotten how much i love this! Made this for lunch today. It was delicious! I did add a splash of white wine and fat free half and half. I also added some handfuls of chopped fresh spinach because I needed to use it up. Very tasty! Thanks for the idea. I would love to know what Baby Bella is? I don’t see it referenced in the recipe instructions…thank you in advance! What would be a good replacement for the chicken cubes? I’m a vegetarian. Should I just use low-sodium vegetarian stock instead of the cubes and water? Can you give any suggestions? Is there any way to substitute something for the white flour that would be more healthy? I was looking for an easy low point soup and this is such a winner I'm taking it to a women's retreat! Delish! I love this! I've made it twice. 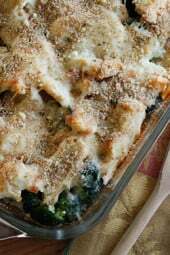 The first time I made it I added spinach because I love spinach and I wasn't used to eating mushrooms so I was worried if I would like it. This time I followed the recipe except the celery (because I have none). Both times I left out the butter. Just finished making this soup and it is DELICIOUS. I just had my wisdom teeth removed yesterday, so I decided to blend all of the soup instead of just one cup, for ease of eating. It was perfect, and quite a treat. Thank you Gina! Oh my gosh, I love this soup. I've even used different mushrooms depending on what's on sale and it's still excellent. I like to make it with half water/half fat-free chicken broth. Soooo good! Made this tonight very delicious. Thanks Gina. I've made this a few times and always adapt it. My favorite was to add a third cup or so of potato flakes (60 calories total) and a glass of white wine, one cup half and half…garlic salt and white pepper. This soup was delicious! My husband and daughters loved it too! It tastes like something we used to get at our favorite French restaurant! I don't have a blender so I used an immersion blender and it did the trick with no mess! We will definitely be having this again! Good heavens, this was delicious. I didn't bother with the blender; just whisked the flour and water well before putting it in the pot. Used all cremini mushrooms, and when it was done I used my stick blender to blend it right in the pan. It was amazingly easy and fast, too. Yum! We are Military and stationed in South Korea. I just made this with an array of Asian mushrooms. It's to die for! Are your nutrition facts per serving? I made this for my soup of the week, and it turned out wondeful!! Soooo yummy! I like mushrooms, don't love them, but this will be made again. I did add one more teaspoon of the Better than Bullion to it. And I think I might have cooked it a little high, because when I was done I only had 4 1.5 cup servings and not five. Wonderful though!!! I ended up using bouillon cubes, and also added rotisserie seasoning and a little chicken stock. Came out great. Served with 1/2 cup rice for dinner last night. Delish. Was even better for lunch today. I love your recipes! I try a new one usually once a week. I made this soup the other night and it was delicious! I was wondering if it froze well? I have a bit left over and don't want it to go bad. Thank you for the yummy and healthy recipes! 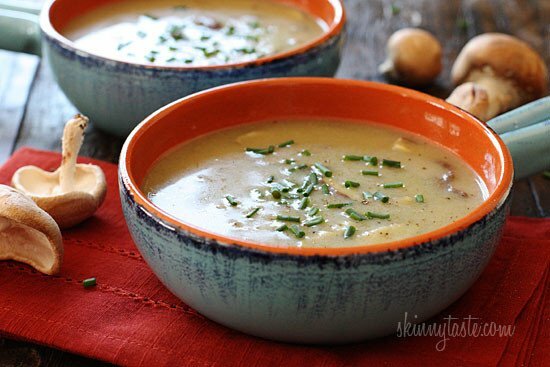 Can this soup be used as a replacement for canned cream of mushroom soup in recipes? 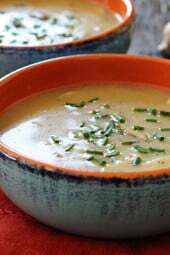 Another great add in to make this taste like a restaurant soup would be to add a tsp of coriander – I've worked with a chef and this was a staple to add to cream soups like mushroom, celery, carrot, broccoli, and cauliflower. I would imagine you could substitute the different veggies to make different cream soups as well! I made this tonight, it was DELISH!!! Everyone should try it, very satisfying and tastes like the soup that is loaded with fat and calories! 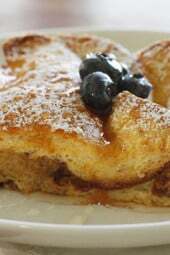 Thank you for an amazing recipe! if i wanted to make a green bean casserole and substitute canned mushroom soup for this recipe, how much of the water would i leave out to make it "condensed," three cups? all four? I made this last night and it was great. I added lots of garlic and oyster mushrooms too. This soup was delicious- I'm the only one in the household who likes mushrooms, so I got all the leftovers for my work lunches throughout the week- it reheats wonderfully! This soup is absolutely amazing!!! I've made it twice in the last 10 days. Shitake mushrooms are a bit expensive but they truly do make the difference in this recipe. Thanks Gina!! Basil or Dill for a springtime flavor. can i replace the white flour with wholemeal flour? I discovered your site by accident & made this soup. It was wonderful.I just made a few changes. I didn't use the blender just put flour & water in a jar.After cooking it I put it in my crockpot & just befolre serving I added a cup of fat free cream and a cup of instant potatoes to thicken it. I let it cook in the crockpot for about 20 min more.I'm 85 yrs young and a new computer user. It's never too late to teach an old dog new tricks. If you do not have broth, and you want to buy something that keeps and saves space which is better than bullion try using all natural "chicken base." Mixing "base" is made from real product and doesnt have the concentrated sodium bullion has and has much more flavor. Tried this soup, pretty good but not creamy. Thinly creamy maybe. I used vegetable stock instead of water, wonder if that was the problem. This didn't freeze well. I took one to work yesterday and the "creamy" stuff (celery and mushroom puree) separated from the liquid base of the soup. 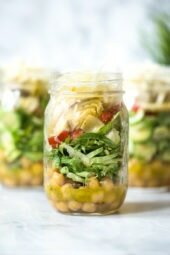 I am making this tonight and was thinking about adding a can of clams, kinda like clam mushroom chowder..Has anyone tried, what do you guys think? This is so yummy!! I made a double batch of it to give to my aunt. I had a little for lunch today and the rest is for dinner tonight with some garlic bread. It was creamy enough, but I added a little bit of half and half to it to make it a little more like cream soup for my hubby. I love your recipes and more importantly it helps me get some healthy meals into my hubby without him even knowing it. I made this for dinner tonight with roasted eggplant and red pepper pesto sandwiches and it was delicious and super easy! My husband scraped the bowl! I made this last nite, fantastic!! And zero guilt if you want a second helping!! !